Ensure a safe, secure grip even in extreme conditions with the 1670TBLKST Tanto Blur Serrated Assisted folding knife from Kershaw. Combined with an ergonomic hold, the Blur's quality material and craftsmanship prevent slipping. The tactical tool features an anodized aluminum handle with durable, textured Trac-Tec inserts for a superior grip. 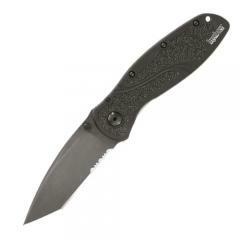 The knife combines a thumb stud with Kershaw's trademark SpeedSafe® assisted opening system to deliver smooth, one-handed deployment of the Sandvik steel blade. The partially-serrated, Tanto-style tip offers versatile cutting power and a sharp tip ideal for piercing. A convenient pocket clip makes the Blur easy to carry in the field or as an everyday carry tool.